We've been interviewed three times about our traveling lifestyle. 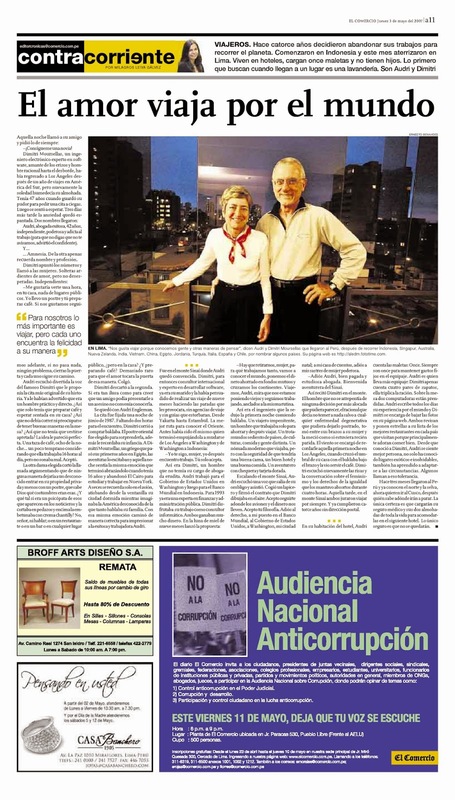 The link from the Peruvian newspaper isn't working anymore so we've reproduced the interview from El Commercio below (which is the largest newspaper in Peru). While we were in Beijing in the fall of 2010, the China Daily (the largest newspaper in English in China) published an article about our Global Meandering Lifestyle. Our picture is on the front page of the newspaper in the upper right-hand corner and click here for the full page article. In December of 2017 the Vail Daily, the newspaper in our tiny town of Vail, CO did a piece on us. Click here to read it.